The Rowe family moved to Washington from Indianapolis in 1889. In 1894, great-great-grandmother Lennie Rowe filed claim for 200 acres of “Desert Lands” near Yakima on which she started growing hops. Her son Walter took over 1,000 acres of land by Olympia, but this plot proved unsuccessful and Walter sold the land. Determined to establish profitable land, Walter bought land near Zillah where he grew apples, pears, and cherries. He was finally successful and continued to be throughout his lifetime. Walter’s son, Charles, his sister and her husband expanded the farm over the years. In 1970, Adam and Morgan’s father, Buzz, took over the family business running the apple and cherry orchards. Buzz “retired” in 2009, but his sons say he is still in the orchards every day. “It seems like people are busy 24/7. What is life about? We live and we die?” Buzz said. “I think there is much more to life than that.” Buzz truly loves working in the orchards, which is why he’s content to “volunteer” on a daily basis. Buzz’s sons Adam and Morgan now run the business - Adam acts as president and “number cruncher” while Morgan prefers running the orchards. Rowe Farms packed their own fruit from 1959-2006, starting with cherries, prunes, pears and apples and narrowing down to apples in the end. 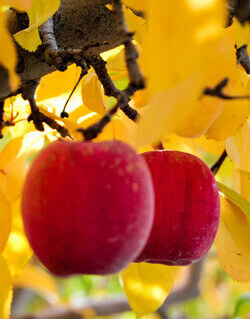 Rowe Farms now owns and runs several orchards in the Naches area. They have 300 acres of apples, 200 acres of cherries, and 30 acres of pears. They are very diverse, growing almost every variety of apples, including: Red Delicious, Golden Delicious, Granny Smith, Gala, Cripps Pink, Honey Crisp, Braeburn, and Fuji. Both Adam and Morgan married their high school sweethearts from Naches High School and have families of their own. Morgan and his wife, Angie, have three children: McKenna, Colton, and Caden. Adam and his wife Mandy have two daughters, Isabella and Emary.